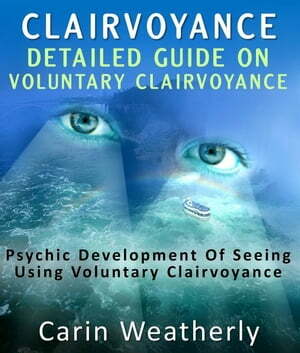 Collins Booksellers - Clairvoyance: Detailed Guide On Voluntary Clairvoyance : Psychic Development Of Seeing Using Voluntary Clairvoyance by Carin Weatherly, 9781301203864. Buy this book online. Following up on her prior book titled “Psychic Development: Sight Beyond Sight Using Clairvoyance Safely” the author now takes it a step further to focus on voluntary clairvoyance which is the positive aspect of the whole process while the involuntary is not as safe. This book covers all of that and more and is an extremely interesting topic to learn more about. For individuals that are interested in these types of topics this book is the perfect one for them. Despite the fact that science denounces these practices as being unfounded there are enough examples provided to get the mind thinking that this may not be the case. It is a must have for anyone that may be studying the topic and needs some additional material or for those that have a vested interest in learning all that they can so they can either understand someone that they know who says they are clairvoyant or think they are clairvoyants themselves. About the Author: With this book Carin Weatherly demonstrates that she really did her research by zoning in on the positive side of clairvoyance which is voluntary. She gives not only a sound working definition of the topic but goes a step further to include all the information that one could ever need to learn as much as you can about the topic without flooding the mind with too much information to assimilate. Carin always had an interest in the paranormal and she focused her interests on clairvoyance when she realized that there was more to it than she first thought. She then made the decision to find out as much as she could and then after she collected all the information she want to share it through her writing.